Cannabios Neutral Balm is a natural balm developed on a base composed of 100% organic raw materials and specially composed for the care and protection of sensitive and reactive skin. The special synergy created between its natural ingredients, among which we find a blend of olive oils and hemp, which together with the natural CC + (Cannabinoid Complex plus) from the hemp plant, and the essential Omega-3, Omega-6 and a large number of antioxidants, nourishes and protects the dermis, offering benefits and properties especially moisturizing, soothing, regenerative and nutritious for the daily care of sensitive skins. general. Neutral Balm Cannabios is recommended for the treatment of allergic, sensitive or reactive skin, which could negatively respond to treatment with other essential oils and products. 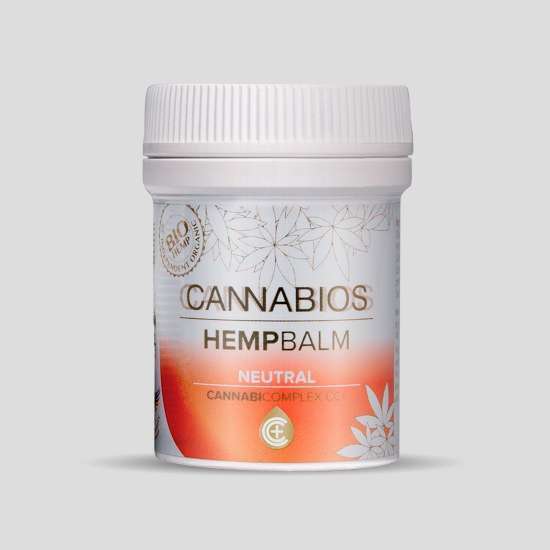 Cannabios balms have been developed and compounded based on knowledge of the effects and function of natural substances on the body, as well as being a natural alternative to chemicals. Made without preservatives, colorants, or added fragrances, Cannabios Balm Neutral is a product of sustainable and environmentally friendly agriculture. Suitable for topical use Apply to the affected area once clean, performing a gentle massage, two to three times a day, as needed. Tengo la piel muy sensible y reactiva a cualquier producto quimico o aceite esencial, he probado este balsamo y gracias a dios no me provoca ningun tipo de reaccion adversa, todo lo contrario me va genial, estoy muy contenta y lo agradezco mucho.